Showing 14 articles from August 2, 2014. Photo by Jerry Gould The Willapa Harbor Airport recently had two new windsocks installed by Port of Willapa Harbor staffers Mike Deniston (left) and Steve Porter.Supervising the installation was Willapa Harbor Pilots Association Founder Bill Kennedy. 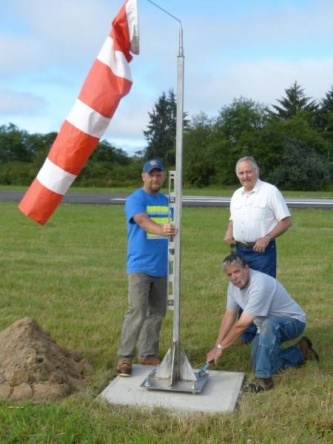 The Willapa Harbor Airport now has two new windsocks that were installed by Port of Willapa Harbor staff members Mike Deniston and Steve Porter. Willapa Harbor Pilots Association Founder Bill Kennedy “supervised” the installation last Thursday. Do you know someone who is doing an outstanding job as a citizen in your community? Has someone impressed you with their efforts in giving back to the community? Professor John Harrington, Jr. will be speaking on climate change after the business meeting Sunday, August 10th, 5:30 pm at the Grange Hall. 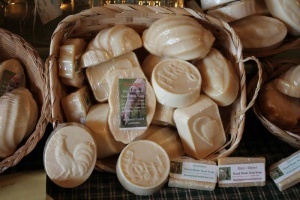 Morning Star Family Farm goat milk soaps are available at the Public Market in Raymond, which is open Friday and Saturday from 10:00-4:00. A soap that creates a creamy lather that will leave your skin feeling baby soft and is infused with scents so delicious, you almost find yourself wanting to take a bite before you stop yourself – although made of goat milk, it’s soap, not food! What’s the process for getting Medicare to pay for an electric mobility scooter or power wheelchair? My 76-year-old mother has arthritis in her knees and hips, and has a difficult time getting around anymore. Looking out of the window in my vacation rental apartment, I sighed at the historical beauty just footsteps outside my door. 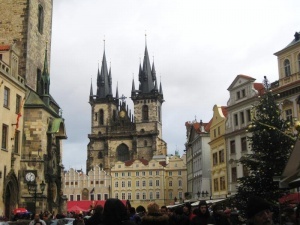 Sprawling across the landscape were hundred-year-old houses with red, tiled roofs and yellow, white, and brown facades. Jaime Herrera Beutler is once again on the attack against the Affordable Care Act (ACA). Free lunches will be supplied throughout the summer, from June 23-August 8, as part of the Washington Simplified Summer Food Program. WASHINGTON, D.C. —Thursday, U.S. Senator Patty Murray (D-WA) released the following statement after Senate Republicans blocked a supplemental funding bill that would provide resources to Western states fighting ongoing wildfires, help address the refugee crisis along the Southern border, and protect Israel from rocket attacks. The Willapa Players Summer Children's Theater presents "Jack's House: A Collection of Foolishness" by Donald C. Correll. A series of comical vignettes are brought to life by our young actors.